What we have found is we have gone down there, the pipes have settled against the side of the BOP and we can't successfully put the overshot devices over them. We've come to the conclusion that any more attempts at fishing are probably not going to result in success. And at a meeting this morning between our science team and the BP engineers it was decided to recommend to the principals, the cabinet secretaries we go ahead with the removal of the blowout preventer and the replacement of the blowout preventer with the one that's on Development Driller 2. This is due to the one whose apparent fragility of the pipe that keeps breaking and falling off to the side and also the unknown condition of the BOP below that and I can talk about that in a little bit. So the plans are right now to replace the BOP. The approximate timeline going ahead is as follows, starting today and through Saturday and Sunday we will make preparations to remove the BOP and replace it. This did not agree with what I saw occurring during the time that I watched both the recovery attempts over the last two nights, and from the videos that others posted on Youtube, and which I referred to in those posts. However, not being a part of the team running this operation there may have been some things happening that I and others are not aware of. I still remain concerned about the condition of the lower section of the BOP and the presence of either hydrates or cement, both in the area of the BOP rams, and around the drill pipe as it extends down into the well. To explain the concern in perhaps a little more detail, let me first talk a little about the casing hanger that the Admiral referred to as one of the limiting well conditions today. The casing hanger is the device at the top of the well that holds the production casing in place. In the extended transcript of his press conference on Friday, he referred to the company that made the hanger (Dril-Quip) and gave a link to the drawing of the hanger, this one, which I have labeled, because I am going to try and explain, using this and other diagrams, what the Admiral meant with some of his remarks, as I interpret them, and some of the concerns I continue to have. The casing comes up through the center and connects to the top element. The weight of the casing now pulls the upper section down, seating the conic surface, and also spreading the elastomeric packer (the black layer) which pushes out against the sides of the surrounding wellhead wall, providing the seal. This seal is between the liners around the top of the well, and the production casing, it is, in other words, the seal at the top of the annulus between the production casing and the wall of the well. I have put this in to explain what the Admiral meant when he was talking about trying to lift the BOP off the well head, which means unlatching it from the top of the well head assembly. The BOP latches around the top of the assembly shown in the top figure. Commencing on Monday and through Tuesday the Discoverer Enterprise will latch on and remove the capping stack. And the capping stack will be temporarily stored nearby on the ocean floor. Once that has been completed the Q4000 will move in and connect to the BOP and will unlatch it. And then there'll be a series of two decision points will occur. We will attempt to pull it free and we are prepared to apply up to 80,000 of force in addition to the weight of the blowout preventer to lift it. We call this the gentle tug. If the blowout preventer comes free we will then use the (Boa Sub-C) and the ROV's to attach a line to it and cut it (the drill pipe) just above the well and at that point we can bring the BOP to the surface on the Q4000. If for some reason the blowout preventer does not come free with a gentle pull, our intention then is to manually open the ram sequentially down through the blowout preventer and then raise the blowout preventer and cut the pipe at the well head. What they’re concerned about is somehow potentially dislodging the hanger and the casing hanger that is at the top of the well. 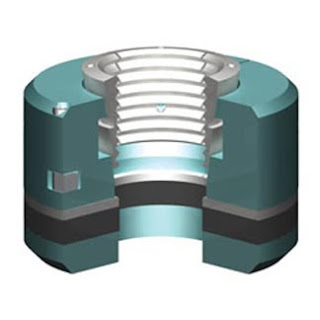 That is also the – as you know that is a device that contains the seal between the annulus and the well and the blow out preventer. 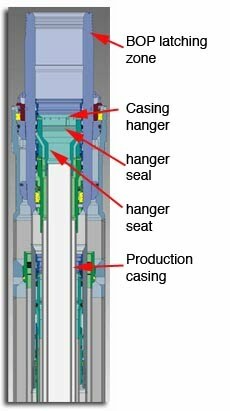 So the threshold for the pull has more to do with the potential to unseat the casing hanger and the seals that seal off in the annulus. So that if you go back to the second illustration, the seal is maintained by the weight of the production casing, pulling the head of the hanger down so that the elastomeric seal spreads. 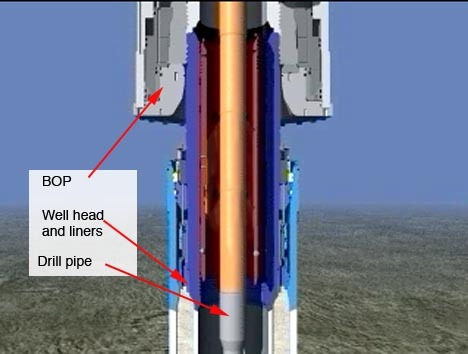 If the upward lift on the BOP is transferred through the drill pipe to the top of the casing, they are concerned that if the DP is held within the casing hanger, that pulling it too hard may take the weight of the seal, so that it contracts back from the wall, and opens up the annulus. Now to explain why that might happen, and why there might be all sorts of other concerns, let me move away from the hanger itself, and go to a modified frame from the Dril-Quip video. (For those looking at the video I have changed the picture to show the center as though it were the drill pipe). To make life easier for me I am just showing the lower end of the BOP, below the rams, the central drill pipe and the upper end of the well head (without the hanger detailed). Now in a normal situation the drill pipe would be held by the three rams at the bottom end of the BOP, and slightly above the picture. In an ideal world there would be nothing else in the gap around the drill pipe (i.e. the annulus). But we know that above the rams, that there is either hydrate or cement around the DP. 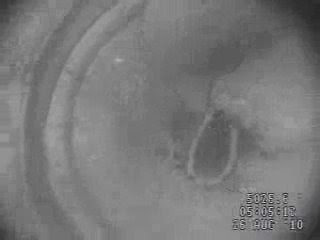 View from the fishing camera showing the top of the drill pipe above the BOP rams, surrounded by what may be either a hydrate or cement fill. What we know is, the pipes that we can see are in pieces, sitting inside the lower marine riser package and we are having trouble lifting them out with the fishing devices. We have no further information and cannot tell the condition of the pipe below the blowout preventer. If the material holding the pipes extends down into the rams of the BOP and below it could fill the upper annulus down through the casing hanger. Thus pulling on the BOP would exert a pull, through the DP and this fill, on the hanger and could unseat it. Should the BOP not move, the plan is to open the rams on the BOP, so that it no longer holds the pipe. But if the rams are cemented in place by the fill, this may be very difficult to do, since trying to flush out that fill on Thursday evening didn’t work. And even if it did work, the fill may occupy the annulus between the BOP and the DP below the rams and above the latch, so that the DP is still held by the cement. (At which point if the chemicals don’t release it they might try the jetting again, since that works both on cement and hydrate). It is only by freeing the BOP from the drill pipe, and hoping that the pipe remains held by the underlying fill within the hanger, that the BOP can be released, removed and replaced. The problem is that if, when the rams are opened, the cement/hydrate holding it is not strong enough, then the pipe may fall to the bottom of the well, carrying with it the evidence on what actually happened to it within the BOP. (Opening the rams will also drop out the other two pieces of pipe currently above the rams). Tough decisions. Not really a tough decision, BT! The primary objective is to abandon the well safely, not to preserve forensic evidence. We already know what happened at Macondo -- BP's managers repeatedly cut corners. Everything else is details. No need to take risks just so BP's lawyers can spend the next 20 years arguing that they might have got away with their corner-cutting if some piece of equipment had worked better. "... it was decided to recommend to the principals, the cabinet secretaries ..."
Now that is more of a concern. Obama's political hacks are the final decision-makers. Scary!